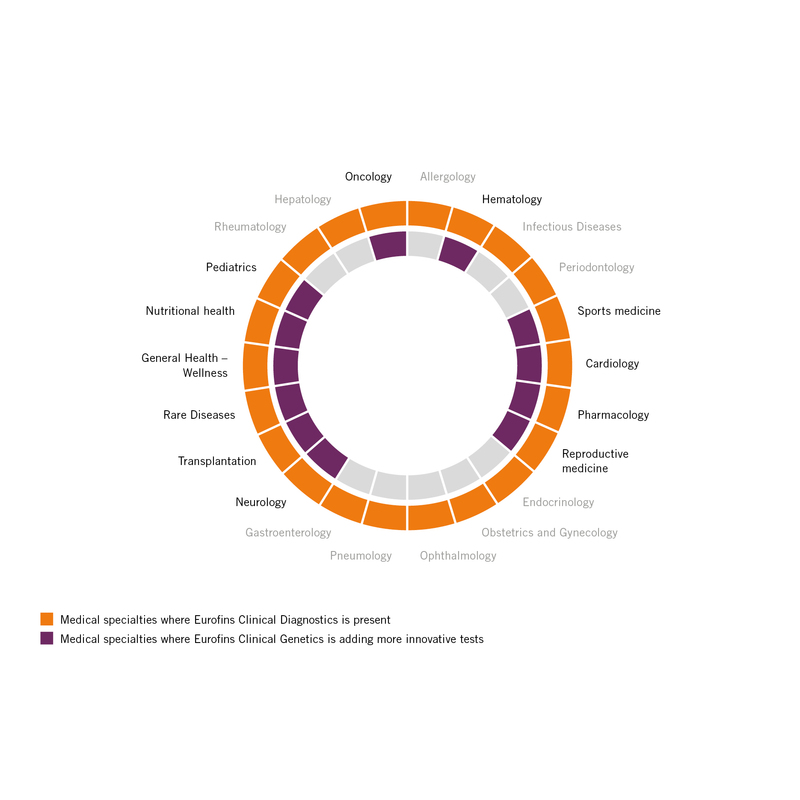 As a central element in healthcare, clinical diagnostics contributes to every stage of patient care: predisposition, prevention, diagnostics, treatment monitoring and prognosis. With hundreds of thousands of clinical diagnostics tests performed every day, the laboratories of the clinical diagnostics division strive to ensure that every patient, wherever he or she lives, has access to the most specialized and most innovative techniques for diagnosis, monitoring and therapeutic adjustment. Our logistics expertise and our daily sample collection and delivery network, guarantee perfect continuity in the provision of care while ensuring the same standard of quality and access to innovation across all the regions we serve. 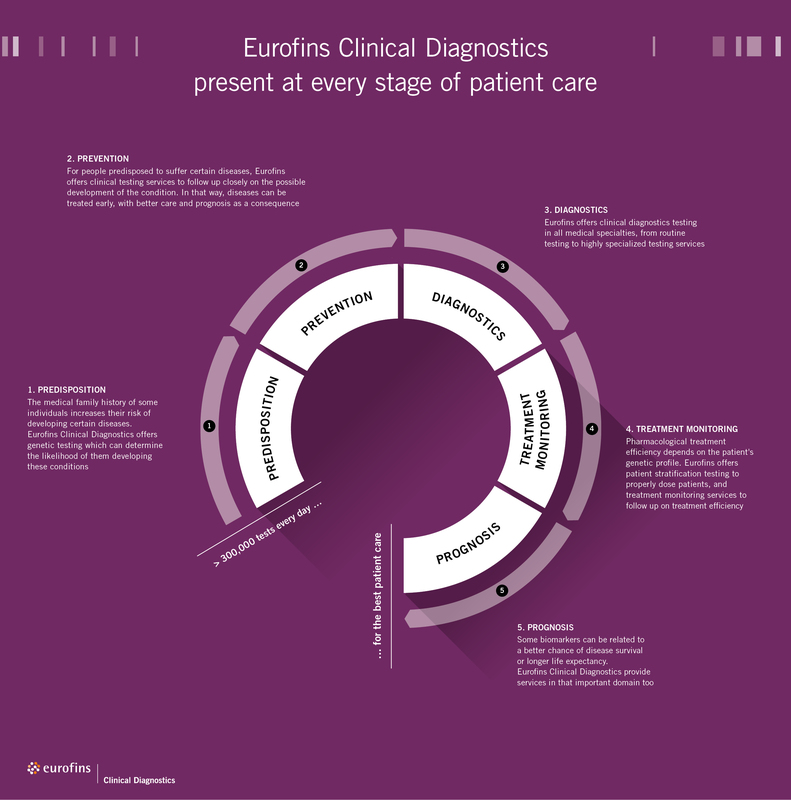 Eurofins stands for a conception of clinical diagnostics entirely focused on excellence, innovation and technological investment. Eurofins clinical diagnostics offers testing services in all medical specialties, from routine testing to esoteric testing including genetic testing. Genetics and genomics are gradually marking out the new outlines of tomorrow‘s clinical diagnostics and our labs are investing heavily in advanced genetic technologies. Eurofins Clinical Diagnostics has a broad portfolio of genetic tests with well-known applications such as Non Invasive Prenatal Testing (NIPT), the screening of hereditary cancers, cardiovascular disease predisposition, rare diseases diagnosis, and personalized medicine applications that can offer patients individualized treatment based on their genetic and metabolic profiles.